Humans and androids crowd the raucous streets of New Beijing. A deadly plague ravages the population. From space, a ruthless lunar people watch, waiting to make their move. No one knows that Earth’s fate hinges on one girl. . . . Cinder, a gifted mechanic, is a cyborg. She’s a second-class citizen with a mysterious past, reviled by her stepmother and blamed for her stepsister’s illness. But when her life becomes intertwined with the handsome Prince Kai’s, she suddenly finds herself at the center of an intergalactic struggle, and a forbidden attraction. Caught between duty and freedom, loyalty and betrayal, she must uncover secrets about her past in order to protect her world’s future. This book was really good but the ending frustrated me! 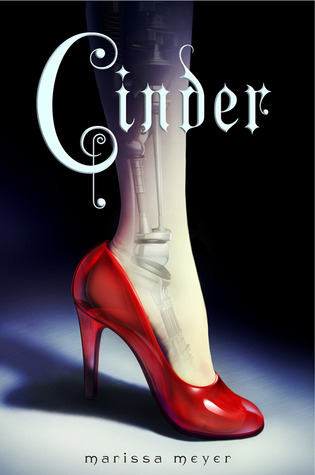 This novel is a fresh twist on the Cinderella fairytale with a cyborg Cinderella. I love the sci-fi aspect to this book that created a whole new futuristic world for Cinder to live in. Cinder is a wonderful character who is smart and fun and willing to do anything for those she loves. I loved the different characters created in the book and especially enjoyed Prince Kai and Cinder's budding relationship. This novel really is close to the original Cinderella storyline except with a few twists. Since this is the first book in a series to come I was frustrated because I wanted to know how Cinder's story ends. However, it would seem I have to wait for the next novel to be released so that my curiosity can be satisfied. I recommend this novel to those who like sci-fi, fairytales, and dystopian novels.